Spray a 9” x 13” casserole pan with non-fat cooking spray. In a large bowl, combine chicken, zucchini, onion, 1/2 cup of the fat free sour cream, ½ cup shredded cheese, cumin, lime zest, salt and pepper. Mix well. In a medium sized sauce pan, melt butter, stir in flour and cook 1 minute. Add broth and whisk until smooth. Heat over medium heat until thick and bubbly. Stir in chiles and remainder of the sour cream, and heat until well combined and heated through, about 3-4 minutes. 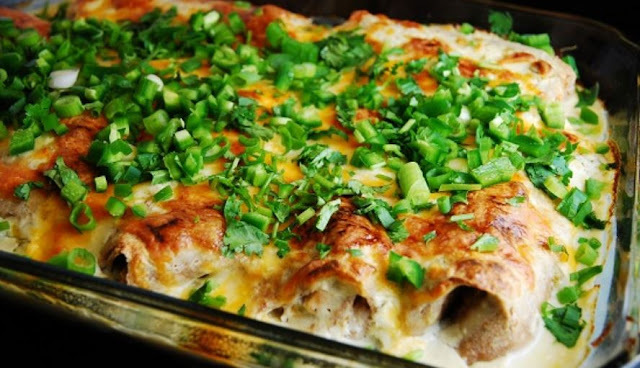 Pour sour cream sauce over enchiladas, and then top with the remaining shredded cheese. Bake in oven for about 20-25 minutes or until casserole is cooked through and cheese begins to brown and bubble. Remove from oven and let cool for 5 minutes. Garnish with fresh cilantro, green onions and diced jalapenos.